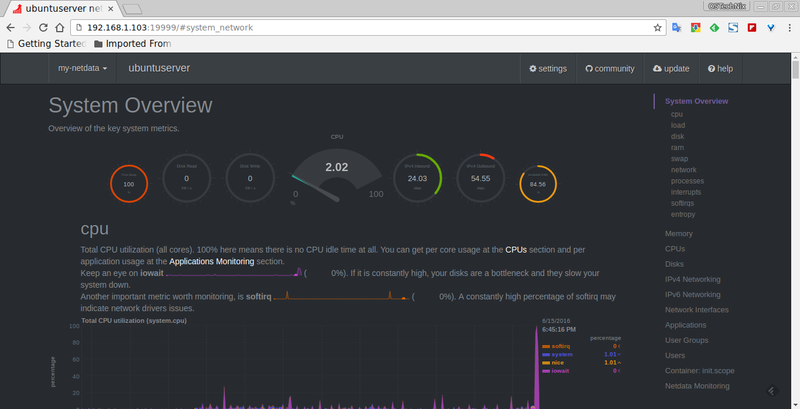 NetData is a free, simple, yet useful utility that provides the real-time performance monitoring for your Linux systems, applications, SNMP devices, and visualize the result in a web browser with comprehensive detail. So, you can clearly get an idea of what is happening now, and what happened before in your Linux systems and applications. You don’t need to be an expert to deploy this tool in your Linux systems. NetData just works fine out of the box with zero configuration, and zero dependencies. Just install this utility and sit back, NetData will take care of the rest. It has its own built-in webserver to display the result in graphical format. NetData is incredibly fast and efficient, and it will immediately start to analyze the performance of your system in no time after installing it. It is written using C programming language, so it is extremely light weight. It consumes less than 3% of a single core CPU usage and a 10-15MB of RAM. We can easily embed the charts with any existing web pages, and also it has a plugin API, so that you can monitor any application. Here is the list of things that will be monitored by NetData utility in your Linux system. At the end of installation, you will see the following message. Copy it to /etc/netdata/ and modify it. NetData is not available in DEB based (Ubuntu / Debian) or RPM based (RHEL / CentOS / Fedora) systems. We need to install NetData using its repository. After installing the required dependencies, install NetData on DEB or RPM based systems as shown below. remote: Compressing objects: 100% (261/261), done. Receiving objects: 100% (279/279), 1.64 MiB | 246.00 KiB/s, done. NetData has been installed and started. If you system behind any firewall, and want to to access the NetData web interface from any remote systems on the network, you must allow the 19999 port through your firewall/router. Open your web browser, and navigate to http://localhost:19999/. You should see a screen something like below. Here, You will find the complete statistics of your Linux system in this page. Scroll down to view each section. You can download and view NetData default configuration file at any time by simply navigating to http://localhost:19999/netdata.conf. In Arch Linux, just run the following command to update NetData. If the updated version is available in the repository, it will be automatically installed. In DEB or RPM based systems, just go to the directory where you have cloned it (In our case it’s netdata). Go to the location where you have cloned NetData. In Arch Linux, the following command will uninstall it. That’s all for now. NetData is pretty simple in terms of installation and usage. You can monitor the performance of your local system or remote system in minutes without much hassle. As far as I tested NetData, it worked well as I expected. Give it a try, you won’t be disappointed.